Craig Groeschel is the pastor of LifeChurch.tv. Yes, they actually have a ".tv" in their name. He started the church in 1996, and it has grown exponentially through several aggressive, strategic, and innovative outreach efforts. In this book Groeschel tries to name and describe that unseen force that pulls people in and catapults them forward. He writes, "Whatever it was, everyone who came felt it. And they talked about it. And new people experienced it" (15). 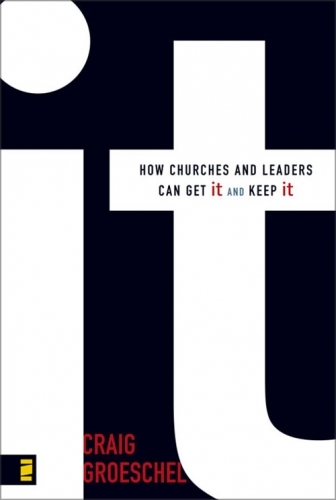 When I started the book I thought that it would be a reference to a church's organizational culture. Or maybe a subtle reference to the Holy Spirit. If it was backdoor language for the Holy Spirit, however, Groeschel would have gotten in trouble with his target audience because they would know that in Christian theological language the Holy Spirit is a person (he), not a thing (it). I think he does a good job describing it, but as you can imagine, it is hard to define. He points out, "When a ministry has it, everyone can usually feel it, but they have trouble describing it. Everyone recognizes it, but no one knows what it is" (29). The closest thing to a definition I found in this book says, "It is what God does through a rare combination of these qualities in his people: passion for his presence, a deep craving to reach the lost, sincere integrity, Spirit-filled faith, down-to-earth humility, and brokenness" (31). Momentum that is moving in a positive direction. If it is hard to define, it's even harder to create. But there's good news: "If you don't have it, you can get it" (18). The flip side is that "If you have it, you can lose it" (18). That's what the bulk of this book is about - as the subtitle suggests. Groeschel is strong here. In this part of the book he unpacks the 7 qualities that contribute to the momentum. "Without a vision, people become comfortable with the status quo. Later they grow to love the status quo. Eventually, they'll give their best to protect what is, never dreaming about what could or should be" (42). "What are you doing that isn't directly contributing with high impact to your vision? The answer to that question needs to be eliminated" (61). "Teams that have it are like a family" (82). "Yesterday's controversy can become today's norm. And today's contemporary becomes tomorrow's traditional. When you have it, you'll find new ways to spread it. But be prepared for what goes with it - criticism" (101). "If you're waiting for your venture to have guaranteed success, you'll probably be waiting for the rest of your life" (117). "Across the board, almost every with-it church I've observed is virtually obsessed with reaching those who don't know Christ" (128). "The self-centered ministry generally loses it. And the kingdom-minded ministry seems to attract it. As you become more generous, God likely will increase your impact and reach" (149). This book doesn't offer all the answers for gaining momentum, but it is a very good and helpful reminder of some very important qualities that contribute to it.